Norwegian Cruise Line has a present for parents: kids* sail free on all ships** and destinations, offering incredible family fun. 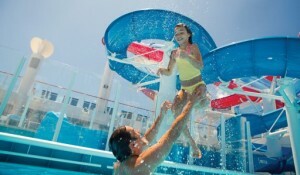 Available from March 1 through March 31, 2014, Norwegian’s Kids Sail Free offer is applicable on new reservations and is combinable with most other offers, including the “Ultimate Freesome” on Norwegian Getaway and Norwegian Breakaway sailings. In addition, families will receive free balcony upgrades, reduced deposits and an e-coupon booklet with over $300 in on board savings. Military, Latitudes Rewards and AARP discounts may also apply to select sailings. Kids can sail free on Miami’s Ultimate Ship, Norwegian Getaway. The line’s newest vessel is now sailing seven-day cruises to the Eastern Caribbean year-round and visits tropical ports of call including Philipsburg, St. Maarten; St. Thomas, U.S. Virgin Islands; and Nassau, Bahamas. Families who book can also take advantage of the “Ultimate Freesome” sales event to receive a free Ultimate Dining Package when they book a balcony or mini-suite, or get a free Ultimate Dining Package and Free Ultimate Beverage package when they book a suite. On board Norwegian Getaway, families can experience a variety of exciting entertainment and activities such as a massive Aqua Park, featuring five waterslides and Nickelodeon themed kid’s aqua park; a 40-element ropes course; rock climbing wall; dedicated Kids’ and Teen areas, and more. Fares start at $599***. Guests sailing from the Big Apple can set sail on board Norwegian Breakaway, Norwegian Getaway’s sister-ship that brings the best of NYC to Sea. Norwegian Breakaway is currently sailing seven-day cruises to the Bahamas and Florida, now through April 27, 2014, and in the fall beginning October 5, 2014, visiting destinations including Port Canaveral (Orlando and Beaches), Florida; Nassau, Bahamas; and Great Stirrup Cay, Bahamas, Norwegian’s very own private Island. Fares start at $599***. Starting May 4, 2014, Norwegian Breakaway sails to Bermuda for the summer with three full days in this island paradise. Families can discover the spectacular Hawai`i islands when they book a seven-day cruise on board the newly-enhanced Pride of America, with fares from $1199***. Sailing year-round from Honolulu, this unparalleled cruise offers nearly 100 hours of port time and visits Hawai’i’s four main islands, including an overnight in Kahului, Maui; an overnight in Nãwiliwili, Kaua`i; stops in Hilo, Hawai`i and Kona, Hawai`i; as well as an afternoon cruise by the jaw-dropping Nãpali Coast. Norwegian Epic, the “Best Ship for Sea Days” by Cruise Critic and “Best Overall Cruise Ship” by the readers of Travel Weekly two years in a row, will offer cruises from Miami to the Western Caribbean this fall. Ports of call on this sun-drenched itinerary include: Ocho Rios, Jamaica; Costa Maya, Mexico; and Cozumel, Mexico; with fares starting at $599***. Norwegian Epic also offers families to discover the rich history of Europe on seven-day Western Mediterranean cruises from Barcelona. Ports of call on this itinerary include: Naples, Italy; Rome (Civitavecchia), Italy; Florence/Pisa (Livorno), Italy; Cannes, France; and Palma, Majorca, Spain. Cruising from Houston this fall, Norwegian Jewel offers families the chance to visit sunny destinations on a seven-day cruise to the Western Caribbean. The tropical ports of call include Cozumel, Mexico; Belize City, Belize; and Roatan, Bay Islands, Honduras. Fares start at $479***. Adventurous families who are looking to experience the majestic beauty of Alaska can do so on board Norwegian Pearl and Norwegian Jewel. Norwegian Pearl offers a series of seven-day cruises from Seattle, Washington, with fares starting at $659***. Families sailing on board will visit Juneau, Alaska; Skagway, Alaska; enjoy an awe-inspiring cruise through Glacier Bay; Ketchikan, Alaska; and Victoria, British Columbia. Beginning on May 17, 2014, Norwegian Jewel departs from Seattle on a series of seven-day Alaska cruises with stops in Ketchikan, Juneau and Skagway, Alaska as well as Victoria, British Columbia. For a shorter family vacation, the whole clan can jump on board one of Norwegian Sky’s three or four-day cruises to the Bahamas from Miami, Florida. Guests cruising on the three day-cruise will visit Nassau, Bahamas and Great Stirrup Cay, Bahamas; with fares starting at $179***. Those embarking on the four-day will visit Grand Bahama Island, Bahamas; Nassau, Bahamas; and Great Stirrup Cay, Bahamas; with fares starting at $179***. Norwegian recently enhanced its youth program, Splash Academy, and teen program, Entourage, and this limited time offer is the perfect opportunity for families to experience these new programs, which have received rave reviews from parents and kids alike. Both Splash Academy and Entourage feature a different theme every day. Whether it’s ocean-related, pirates, space cowboys, jungle fever or circus, every day offers kids a new surprise – tailored to their specific age group – Turtles for ages 3 to 5; Seals for ages 6 to 9; and Dolphins for ages 10 to 12. The enhanced curriculum focuses on team building and developing children’s interpersonal and confidence-building skills. Through a partnership with King’s Active, Splash Academy also offers active sports programs along with the Big Top at Sea program, a circus program, sponsored Hilario Productions, Inc., a New York-based company. Splash Academy also offers the Guppies program for babies ages up to 3, featuring hosted activities for little cruisers and their parents who can enjoy sensory play and painting classes featuring “Wee Can Too” organic art products. To take advantage of the “Kids Sail Free” limited time offer, book by March 31, 2014 by contacting a travel professional, calling Norwegian at 888-NCL-CRUISE (625-2784), or visiting www.ncl.com.